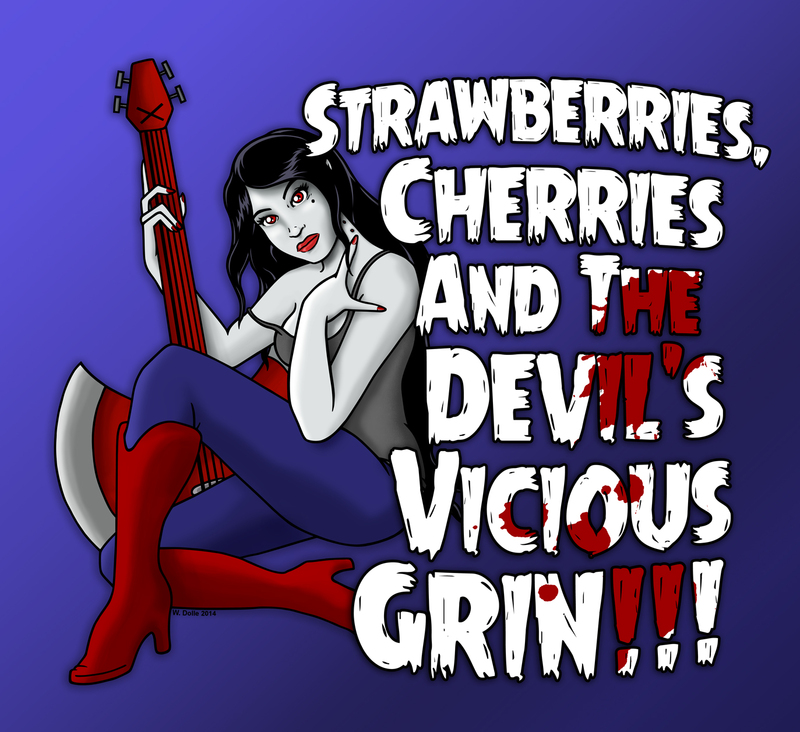 I’ve finally finished my Marceline “pin-up”. It took me almost a day to figure out which font I should use and how to put it on the picture without messing it up. My first idea was to use a an ornamental tattoo font but in the end I settled for horror-themed writing. At one point I had a spiderweb in the background but it took too much away from the character and was a bit distracting. Another idea was to have everything but the axe-bass, eyes, lips and boots colored in shades of grey, but the blue pants felt too iconic to not have them in their familiar tone as well as the slightly “greenish” skin. When I started thinking about a good slogan/title dealing with “rad/red stuff”, Nancy Sinatra’s famous song Summer Wine came to my mind. Obviously, I changed the lyrics a bit. This entry was posted in Apparel, cartoon, Comic, Life, series, tv and tagged adventure time, marceline, Nancy Sinatra, vampire on November 14, 2014 by Wloem.